Some of you might have noticed that my posting frequence is down a bit. Sorry about that! I just can't handle daily blogging at the moment, but I'll try to post as often as possible. I have lots of cookbooks and new fun stuff to tell you about - I just have to get around to actually write. And cook. I cook less new things at the moment, which also means less to blog about. 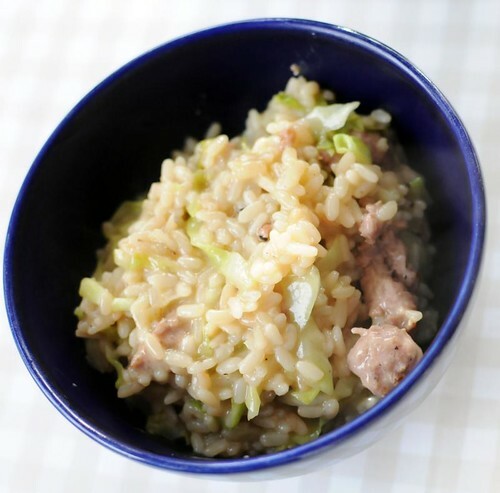 But lately, I cooked this great risotto with fresh salsiccia sausage, and cabbage. You might think cabbage is a strange thing to add to a risotto, and.. well, sure. But it's really, really good, so do try it! I first did it when I had a leftover cabbage wedge that I wanted to use up, but since then, I've repeated it many times. Start by putting on a pot to heat the stock, which should be simmering. In a large pot, heat the olive oil. Squeeze the salsiccia from the casings, and divide into small pieces. Dice the onion, and fry along with the salsiccia for a few minutes. Add the rice and fry for another minute, until the rice is shiny. Add the wine and let it reduce for a few minutes on high heat. When it looks dry again, it's time to start adding the stock, a ladle at a time. Add more as soon as the risotto looks dry. It usually takes me about 20 minutes in total. Taste the rice - it should be cooked through but not mushy. You might not use up all the stock, or you might have to add a little hot water. When there's a few minutes left - add the cabbage. When the risotto is done, add the parmesan. Taste to see if you want any seasonings - I often add a little bit of lemon or honey, and sometimes a few drops of a smoky chili sauce.